This is the fourth in a series of blog posts by Jason Spicer and Lily Steponaitis, who are both conducting research on values-based banking in association with the work of MIT CoLab’s 2015-2016 class of Mel King Fellows. This summer, they were based at the offices of the Global Alliance for Banking on Values (GABV) in the Netherlands, and travelled to meet GABV member banks around the world. 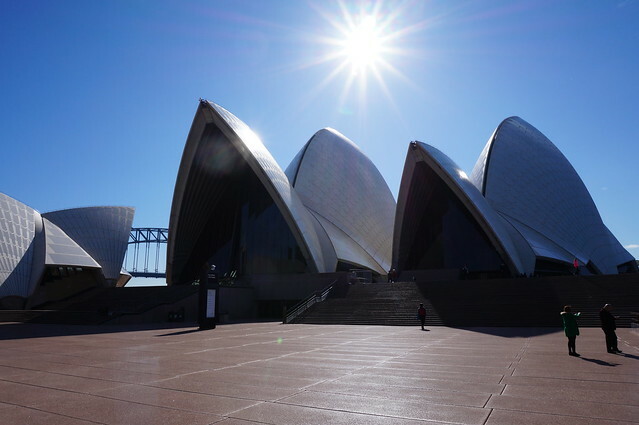 Sydney Opera House in Australia. Photo Credit: Lily Steponaitis. Geographically, Australia is about as far from Boston as one can go. The Australian banking market, however, is quite similar to the US in that it is dominated by a handful of “too big to fail” banks. Down Under, the “big four”, as they are called, are: The Australia and New Zealand Banking Group Limited (ANZ), The Commonwealth Bank of Australia, National Australia Bank (NAB), and Westpac. The consolidation of these banks has been limited under a federal “four pillars” policy, blocking any future mergers or acquisitions between them. While this policy limits the growth of the big four, it also reflects their dominance in Australia. These banks benefit from massive economies of scale and are considered among the most profitable banks in the developed world, posting combined earnings of $28.6 billion in 2014. Though cooperative banks like credit unions and mutual banks have traditionally appealed to Aussies as community-based lenders, the big four are increasingly competing in this domain. For example, through “multi-branding” strategies, members of the big four acquire smaller banks but market these smaller institutions as independent and competing with the big four. Growing competition from the big four and other factors have contributed to a dent in profitability and encouraged rapid consolidation in the cooperative banking sector over the last ten years. Through consolidation, credit unions are seeking growth, greater efficiency and economies of scale. However, a tension can arise between the core mission of the cooperative and the realities of going to scale. On the one hand, values-based cooperative banks aim to address the financial and social needs of their members in a way that is relevant and responsive to local conditions. On the other hand, there is a looming threat related to achieving scale: loosing touch with these core values. This raises the question: Is it possible for a credit union to efficiently and effectively serve communities and customers spread across a continent, without losing touch with its core values? Bank Australia, known until recently as bankmecu, is one of the banks facing this question. Bank Australia’s Conservation Reserve. Photo Credit: Bank Australia. With customers in every Australian state, Bank Australia has approximately $3.2 billion in assets under management (2014) and is a member of the Global Alliance for Banking on Values. For Bank Australia, resolving the tension outlined above prompted a focus on addressing an issue that affects all communities on the continent: environmental sustainability. In 2008, it started a customer-owned conservation reserve. The reserve serves as a biodiversity and carbon offset site for all new homes and cars financed by the bank. It is not uncommon for mainstream banks or large businesses to purchase carbon offsets as part of their corporate social responsibility programs. In fact, this was what Bank Australia did before it founded the reserve. Establishing its own conservation reserve signified a long-term investment in both offsetting carbon and protecting biodiversity across the continent while supporting the local community where the reserve is located. How does the Conservation Reserve Work? Volunteers at Bank Australia Conservation Reserve. Photo Credit: Bank Australia. 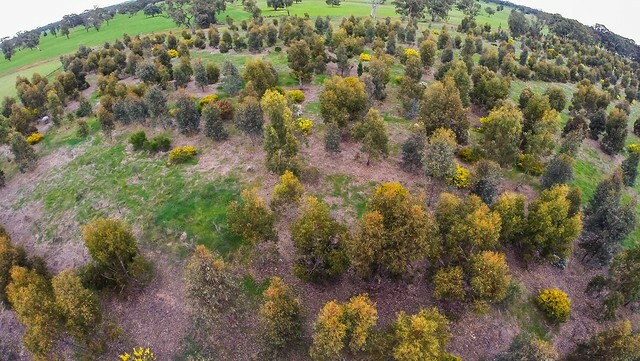 Partnering with several conservation groups, the bank purchases plots of land in western Victoria that carry permanent conservation covenants. Under the covenant, even if ownership of the property changes, the land will remain undeveloped. 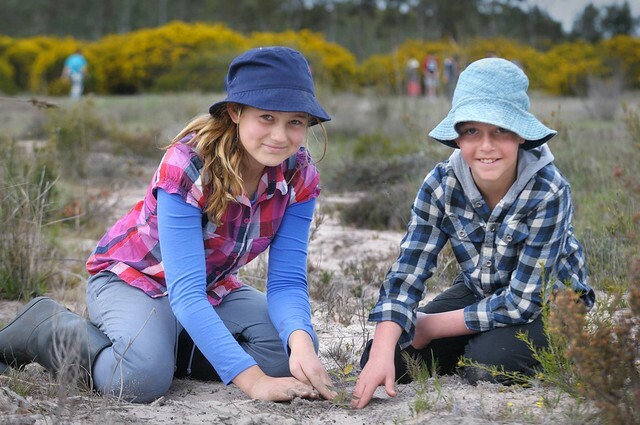 When Bank Australia services home and car loans, it purchases parcels of degraded farm land and works with conservation groups, community groups, and schools to plant trees and re-introduce native species. Bank Australia’s plots are connected to Habitat 141, a multi-state, 50-year conservation project to restore biodiversity and build a conservation corridor along the 141st longitude, which cuts across the length of the continent. Bank Australia only purchases unproductive or marginal farmland to expand the reserve. In some cases, local farmers have been trying to sell their land for a long time, with no prospective buyers. For these owners, the bank’s acquisitions can act as a vital economic lifeline. Currently, the bank owns nearly 1000 hectares and since 2008 has offset over 57,800 tons of carbon. That is the equivalent of taking more than 14,450 cars off the road for a year. The conservation reserve is a means for Bank Australia to enact its values at a national scale in a way that distinguishes it from the rest of the banking sector and benefits the local community. While there is no easy path for cooperative banks seeking to compete and offer values-based financial services at the national scale, there are lessons to be learned about what works and what doesn’t. If US credit unions could operate nationally and find innovative ways to make a commensurate national impact, might they be able to better compete against the major players? As we watch the Australian market unfold, we might find an answer to this question. Post by Jason Spicer and Lily Steponaitis.